I hadn’t seen my friend and fellow foodie blogger Jill in quite some time. Usually we hit up the local farmer’s market together, but this time we decided to do something different. 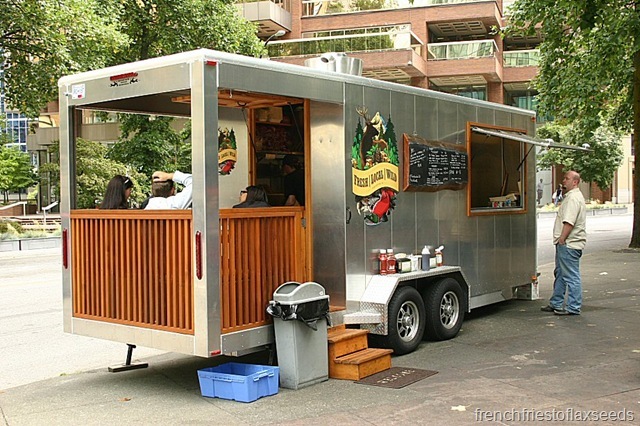 She came up with the brilliant idea to organize a food truck crawl of some of the fabulous array of food trucks out and about downtown Vancouver. We each chose 4 trucks we wanted to go to, and she organized our day – map, hours of operation, order of trucks, etc. 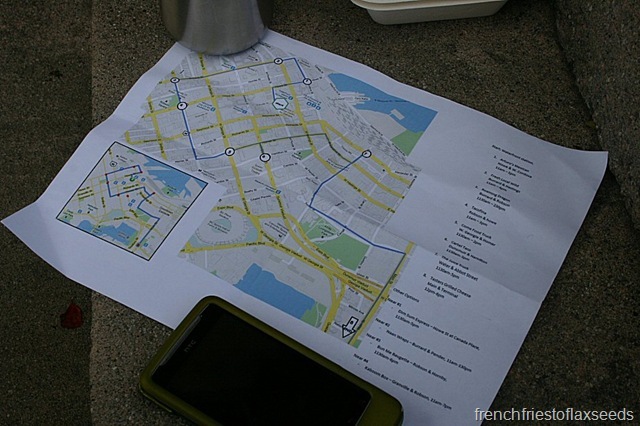 We each had our own printed copy of the map, and Jill packed her “food truck crawl” kit – disposable knives and forks, napkins, toothpicks, wet wipes, and tupperware for leftovers. 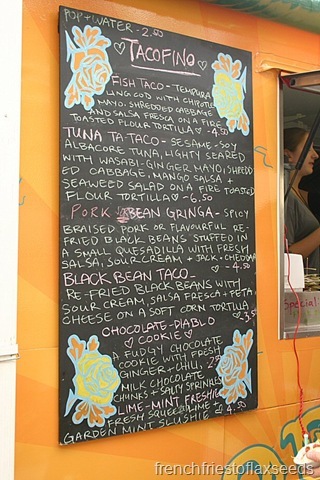 Pretty much everything you could possibly need for an afternoon filled with street eats! We set out early (someone showed up at my house earlier than scheduled – I hadn’t even gotten the chance to put on a face yet! ), and made our way into Vancouver on transit. The plan was to get downtown right when our first truck opened at 11 am. 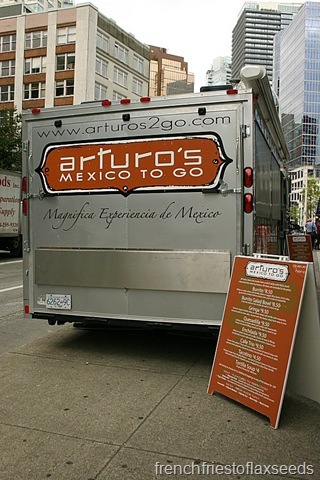 First on the tour – Arturo’s Mexico To Go, located at Waterfront Station. When we walked up to Arturo’s at 11:15 am, we were disappointed to see they hadn’t opened yet. So we sat and waited for about 15 min before the windows were open for business. This gave us plenty of time to peruse the menu and decide what our first taste of the day would be. Someone is giving me some serious stink eye for taking her picture. Jill got her order right away, but when I went to get my soup, they decided that it was actually not hot enough to serve, and took it back to reheat it more. 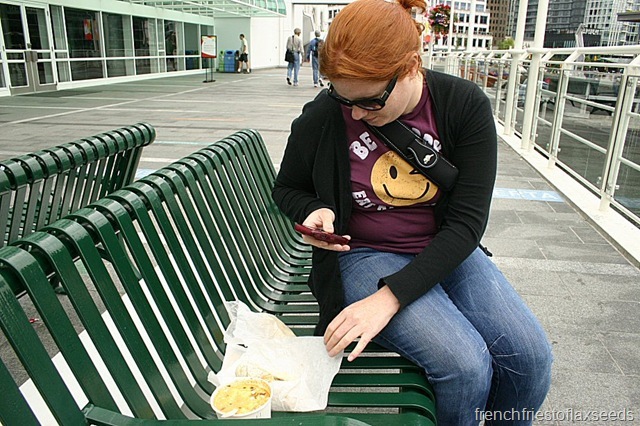 Soon enough we were in possession of eats, and found a nice place to sit down near the cruise ships. Jill was in charge of updating Twitter throughout the trip. 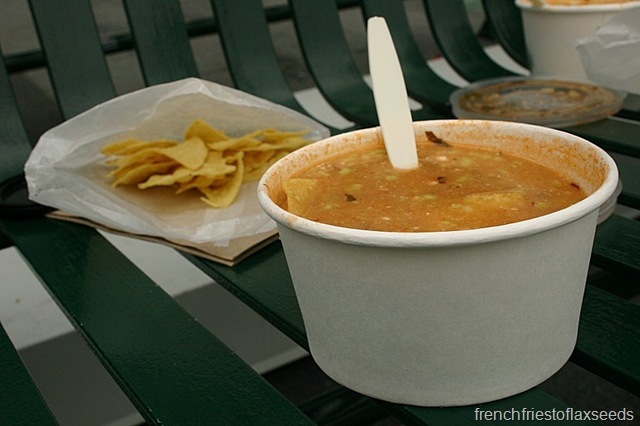 Since their description of the soup is pretty…useless…here are our thoughts. The soup had great flavour, nice spice (I ordered mine medium, and they added the required sauces/salsas to make it so). But it was thin, more like a broth. 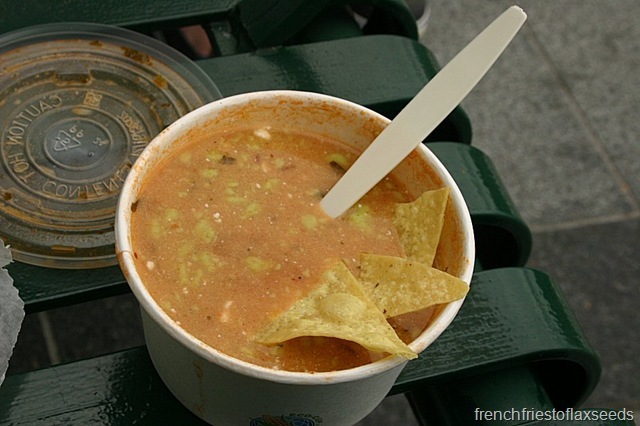 I always imagine tortilla soup to be thick and hearty, much like a stew. This soup would greatly benefit from some shredded chicken or beans and veggies. But I guess that’s what you get for $4. 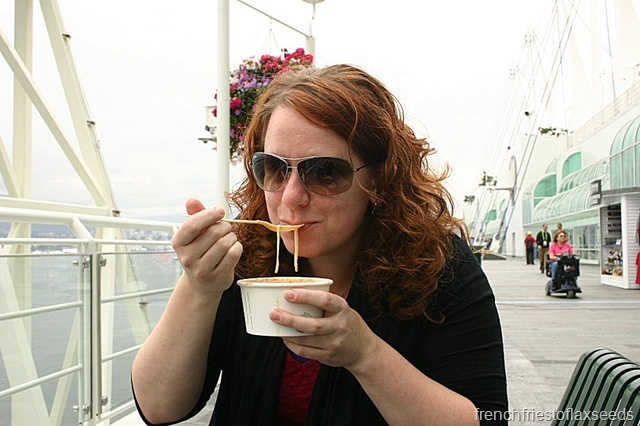 Keepin’ it classy with melty cheese strings. 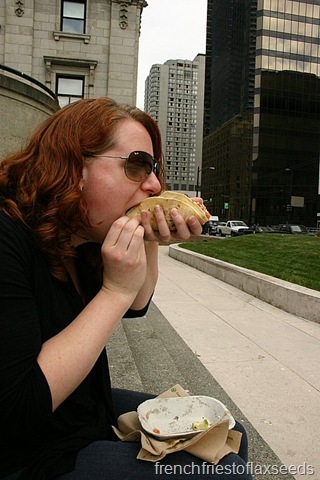 Jill’s thoughts on the tacotino: enjoyed the caramelized onions but felt it was lacking something. More cheese & salsa would have been a good addition. Good value. I managed to score a bite (okay, Jill offered me half), and thought it was a tasty little snack. I liked that it wasn’t swimming in chipotle flavour, as I find it overused so often. 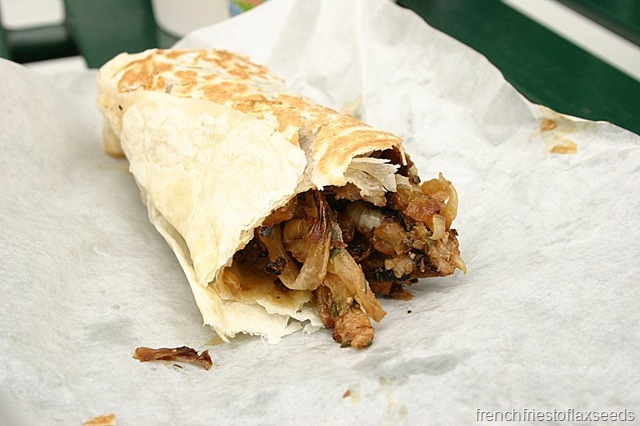 The caramelized onions really were the star – it would have been boring without them. While we finished off our first street food bites, we were joined by this little guy. Since we deemed the tortilla chips as simply unnecessary filler (hey, there was alot of food to come), we shared with him. He was ever so happy to help us out. 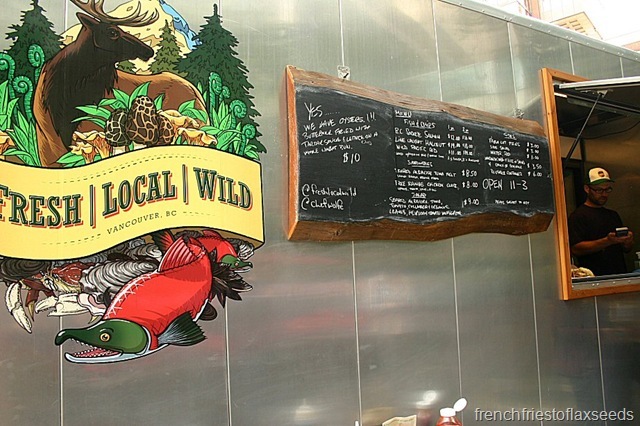 A short walk up the street brought us to our next stop – Fresh Local Wild, located at Hastings & Burrard. 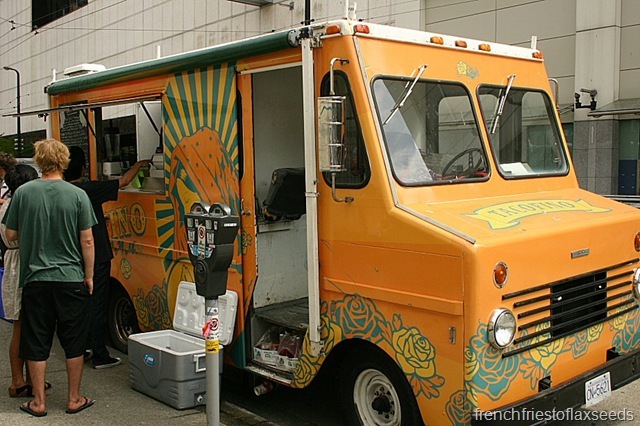 This is not your typical food truck. 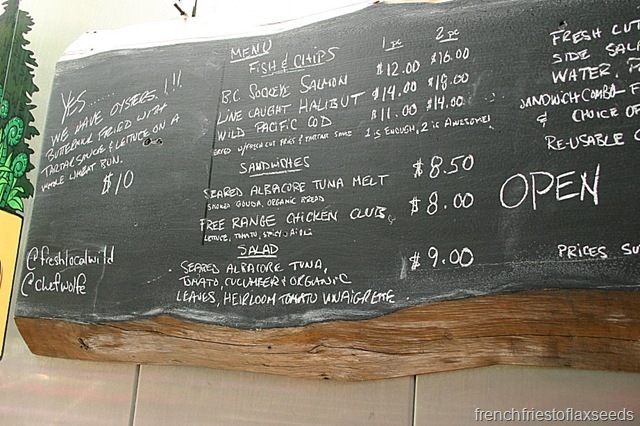 They source their seafood from local fishermen, and other ingredients from ethical farms and sustainable wild harvest. This means they have an ever changing menu based on what’s currently in season. But what’s also unique about their truck is that it does not rely on petroleum-based fuels – instead they have converted a high efficiency diesel generator to use 100% vegetable oil. As their site says – they run on fish n’ chips! Oh yeah, and they are the only food truck in Vancouver with their own patio. Sadly the patio was occupied when we got there, but that didn’t deter us from ordering something to eat. Their menu items are generally all meant to be a meal, or at least more than just a nibble, so we decided it would be in our stomachs’ best interest to share something. 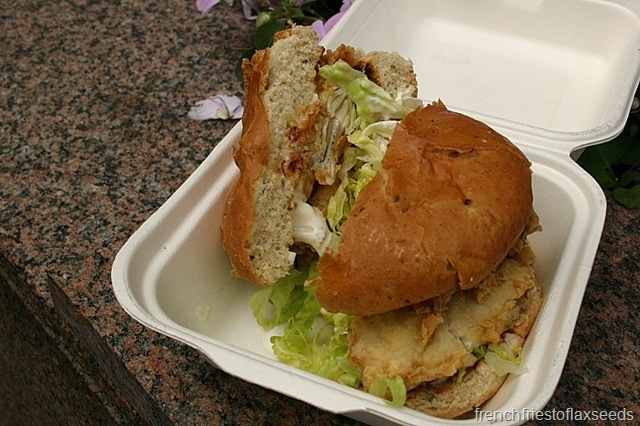 As soon as I saw the oyster sandwich on the menu, I knew I needed to try it. Fortunately Jill didn’t object. As we placed our order, the friendly gentleman behind the counter (sorry, I didn’t get his name), told us the oysters were harvested from…crap…somewhere on Vancouver Island (I can’t believe I’ve forgotten already), and highly recommended the sandwich. He even made sure they cut it in half for us, since we were sharing. Check out those perfectly battered and fried oysters. Deserves one more photo. Oh man, this sandwich was good. It was so fresh (local, and wild!) 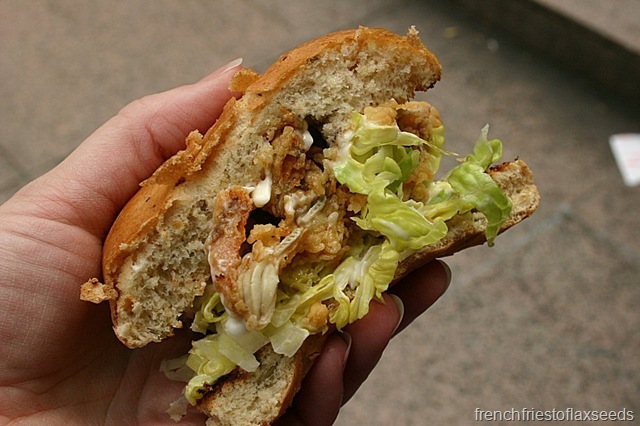 – piping hot from the fryer, crispy, salty like the ocean, with creamy tartar sauce and the perfect bun. I really liked that the batter was thin and didn’t overpower the oysters. Not greasy at all. I could have eaten a whole one. I considered going back and getting another. It was probably the highlight of my day. Sure, it wasn’t cheap, but the quality of the ingredients completely justifies the price. If I worked downtown, it would be hard to not go here on a regular basis. I know I’ll be back to try out their fish and chips. 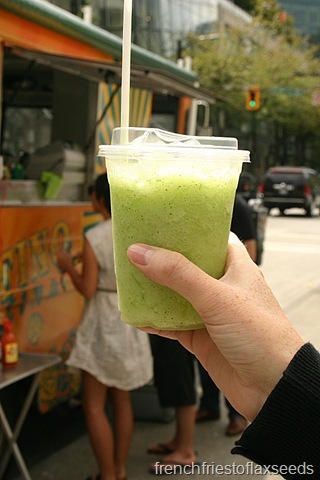 Our third stop on the tour was another short walk away at the corner of Robson and Burrard – Roaming Dragon. While I had sampled their offerings on another occasion, Jill had yet to try out probably the most famous (aside from Japadog) food truck in Vancouver. Just check out all the “street cred” they have received. My plan was to just try the pork slider, since I had passed on it last time I was there. 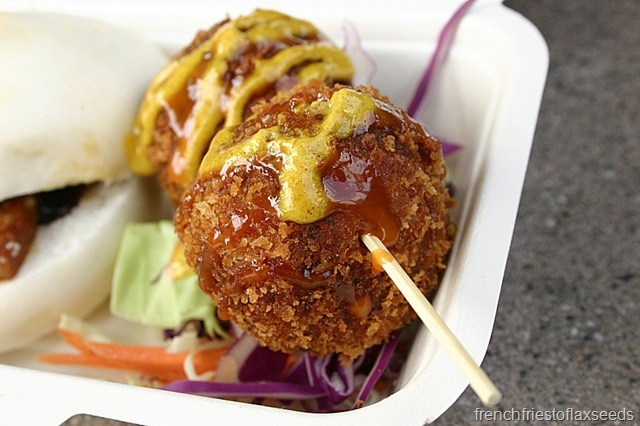 But they I remembered the fried rice balls ($3)…and had to add them to my order. Mmm, rice balls. Sadly these were not quite as good as last time. Almost like they were overcooked, on the verge of being burnt on the outside. Jill felt they were over-hyped, which I can understand since they were not up to par from my last experience. Although the anaemic looking steamed bun didn’t make for the best photos, it was the perfect vehicle for this little Asian inspired slider. 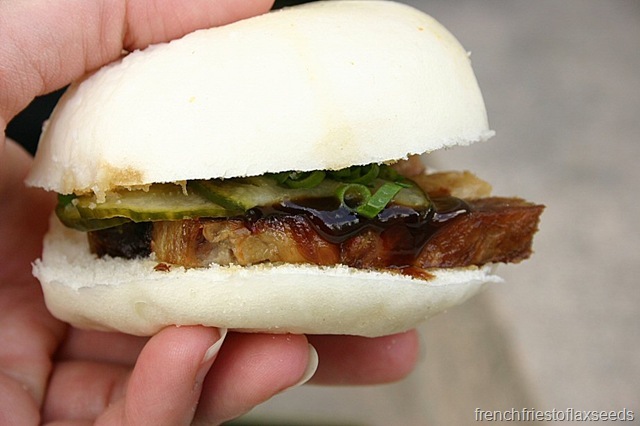 You know those Chinese BBQ pork buns you can buy? Yeah, this tastes just like those, but with the addition of pickled veggies. Plus it’s cute because it’s a slider. I could see picking up a couple of these for lunch and being completely happy. Probably my 2nd favourite eat of the day. Jill’s thoughts on the slider: BBQ pork slider was THE BEST. 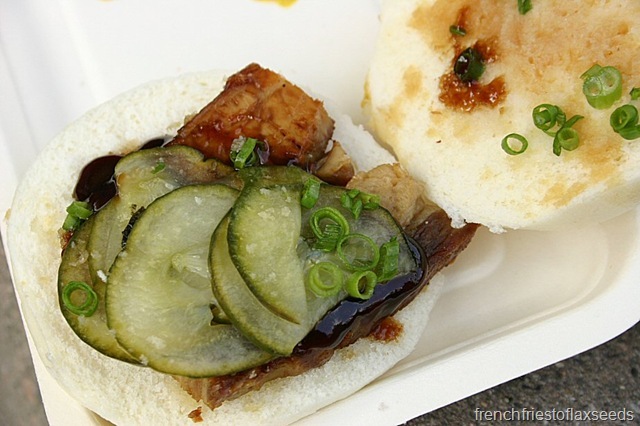 Perfect BBQ pork on a sticky and slightly sweet steamed bun with pickled veggies… very well balanced. A very economical stop, as they have nothing on the menu over $6. Perfect for a snack or a full meal. We took a little digestion break after eating at Roaming Dragon. Food truck tours require conditioning! But wouldn’t you know it – we could see our next truck from our lunch location outside the courthouse. So we picked ourselves up, and made the short walk to the corner of Robson & Howe to check out Tacofino. This was on my “must visit” list after seeing them featured on Eat St., as well as hearing good things about them from other friends. 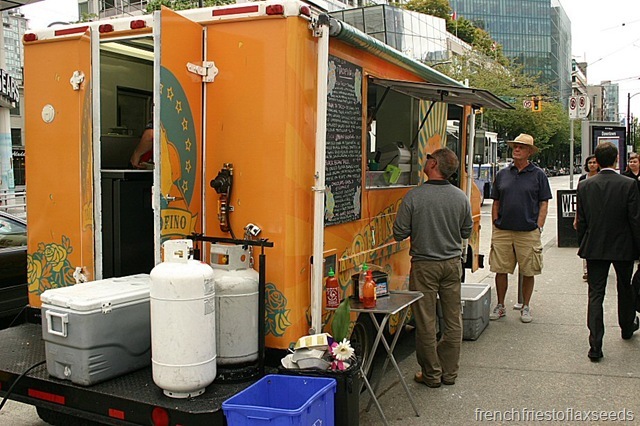 Tacofino actually has two trucks – the orange truck in the downtown core is the “taco” truck, while their blue truck located at Granville & Broadway is the “burrito” truck. Hence the taco-centric menu. In keeping with my student budget, and wanting to balance my meat eats with vegetarian options, I decided to try out the black bean taco. 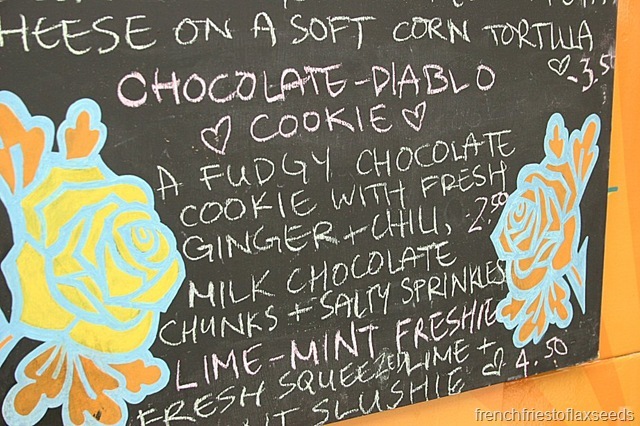 And I had to order one of their chocolate diablo cookies – after seeing it raved about on TV, I needed to know what the hype was about. Jill went with the tuna ta-taco and a cookie. I may have scammed a little sip as well. We both thought it was very refreshing, with a heavy emphasis on the mint. A good pairing for Mexican eats I would say. I topped it with a little hot sauce, to give it an extra kick. The sign of a good taco – super messy to eat. After my attempt to eat the taco with my hands, I gave up and resorted to the fork and knife in my food truck tour kit (thanks Jill!). 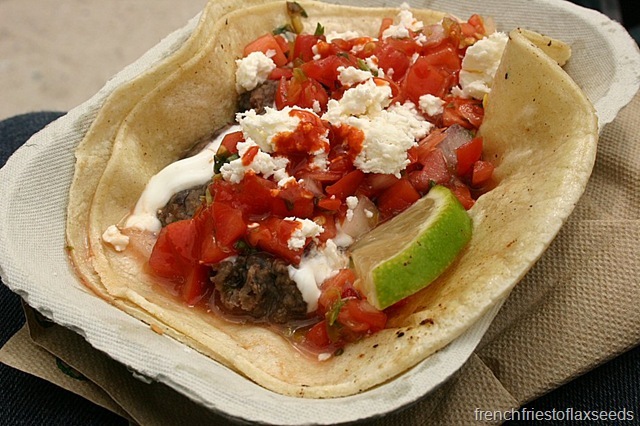 The taco was great – creamy black beans, salsa not overloaded with cilantro, and a nice salty, tangy kick from the feta cheese and sour cream. 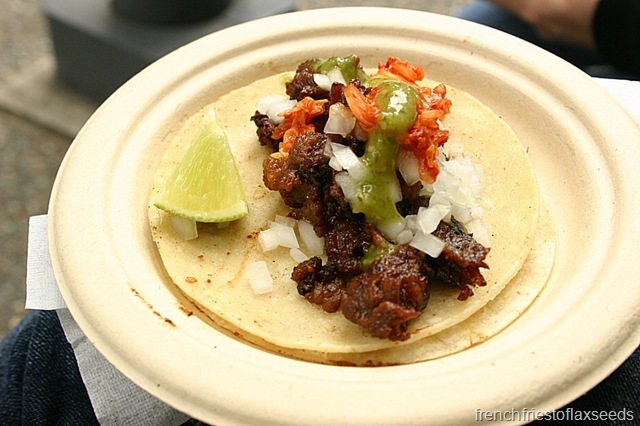 The corn tortilla added a bit of chew and texture to the taco. I was glad I added hot sauce, as I felt it didn’t have a huge amount of spice. For some reason I was given two tortillas (not sure if this is standard), but I chose to only eat one to avoid getting too full. Jill’s thoughts: Delicious. Very light and fresh tasting. Addition of seaweed on top was surprisingly good. A bit expensive. As much as I wanted to bite into this masterpiece of cookie bakery, I refrained and saved it for later on at home. Okay, that’s a lie – I had a nibble while I was still downtown. Now, let me just state, I am not a lover of ginger in my sweets. So I was a wee bit hesitant on this cookie, but with all of the glowing reviews, felt it would be wrong to not give it a try. And you know, I was pleasantly surprised. 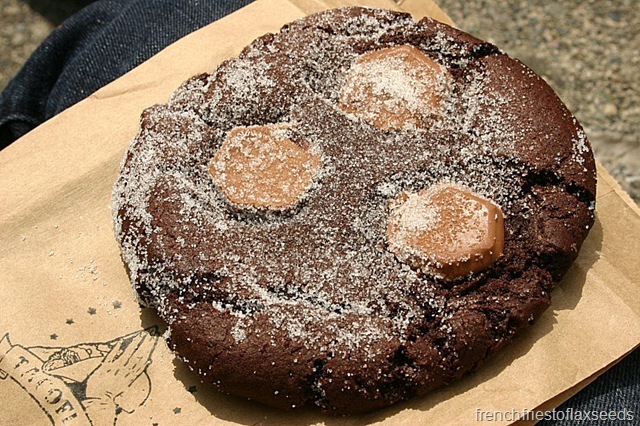 All sorts of chocolately goodness going on – the chewy fudgy cookie plus the milk chocolate chunks on top. The ginger hits you first, with the chili following to give you a nice lingering subtle burn in the back of your throat. I would probably cut back on the ginger a bit (Jill agreed), and would have liked a more prominent saltiness to contrast the sweet cookie, but that wouldn’t keep me from going back to get another. Or perhaps making them myself – the recipe for their cookies just happens to be on the Eat St website! You’d have thought we’d had our fill of Mexican food by this time. Actually, the plan was not to hit up two taco trucks in a row. We were going to head to Coma Food Truck after our stop at Tacofino, but sadly we weren’t going to make it before they shut down for the day. So instead we made our way to Cartel Taco, which we actually found by accident as they had moved their location up to Dunsmuir & Granville. Fortunately, their tacos are different from those at Tacofino. At Cartel Taco you will find Korean fusion tacos – beef or pork bulgogi served on corn tortillas with cilantro, onions, and kimchi. They had me at kimchi. 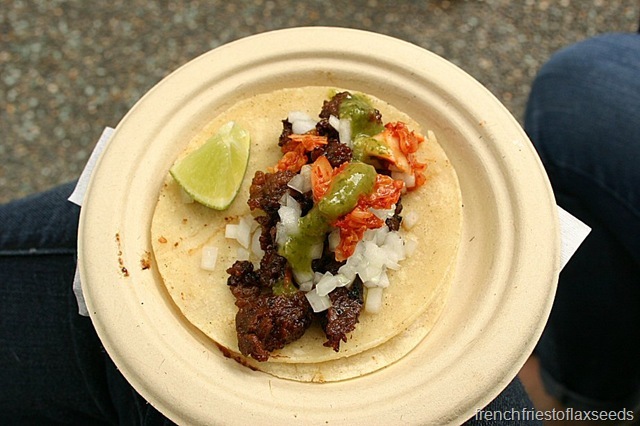 And the price was right – $3 for one taco. Jill & I went with the beef bulgogi, and I skipped the cilantro. Again with two tortillas. Not sure what that’s about – definitely not enough filling to warrant two. I’m all for fusion food, but something with this was just off. We thought the beef bulgogi was tender and flavourful, with the nice pop of spice from the kimchi. But it just didn’t go with the corn tortilla. 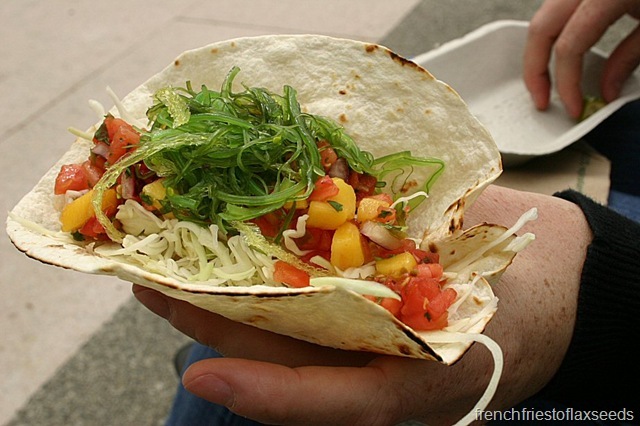 Perhaps a flour tortilla instead, or even better – just skip the fusion and serve it on rice. It was like the corn flavour was competing too much with the bulgogi. Good value for a snack, but not my cup of tea. 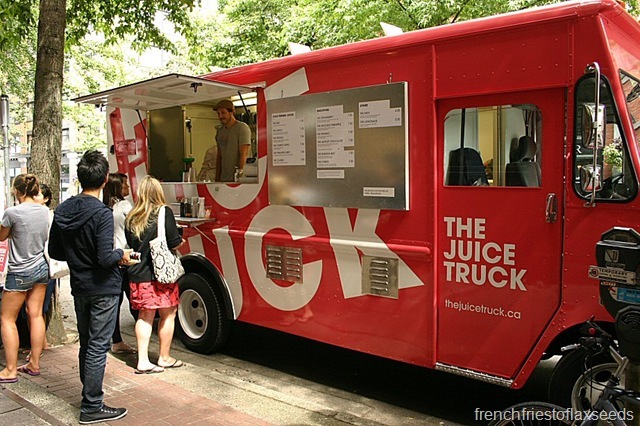 Our route next led us to the corner of Water & Abbott in Gastown where one of my favourite trucks is located – The Juice Truck. Always an enjoyable experience. We spent some time chatting with the guys, telling them about our food truck tour, sharing our favourite spots, getting tips on what to try out next time. Oh yeah, and we ordered juice. While Jill had The Strawberry (which I had on my first visit), I went with their special, The Strawberry Rhubarb Lemonade – rhubarb and strawberries with vanilla, ginger, mint, and lime ($5). I know, ginger twice in one day? Who am I? Again, I was leery, but Ryan gave me a taster of the lemonade, and the ginger was really very subtle. The mint was forefront with incredible sweetness from the strawberries. I was actually surprised at the lack of tartness in the lemonade – you’d think with lime and rhubarb you would get a rather tart drink, but this was sweet. Totally refreshing, and such a bright cheery colour. 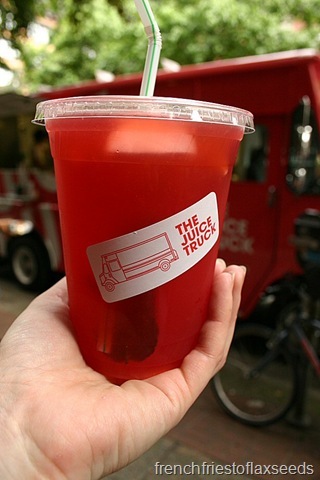 Love me some Juice Truck! Jill actually wasn’t completely sold on her smoothie. She felt the texture from the cacao nibs was off-putting, and that the addition of agave was probably not needed. This actually ended up being our last stop for the day. We had planned on 8 trucks total, but only made it to 6. One was due to their short business hours, and the other one we passed on our way to the train, but just weren’t in the mood for more food. In fact, I may have had a nap on the train on the way home. What can I say, I was on the verge of a street food coma. 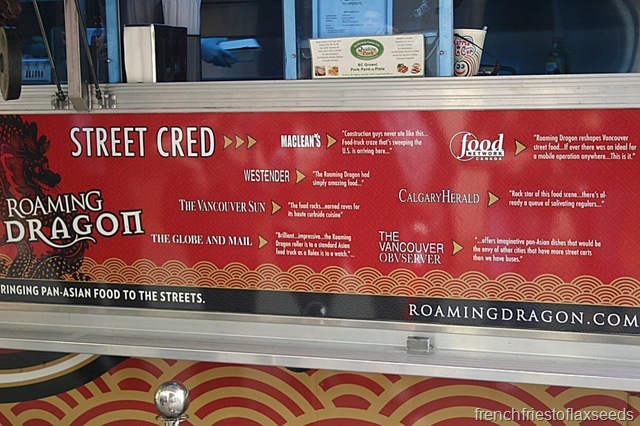 The food truck tour was a really fun way to get out and try a variety of the food truck options now available in Vancouver. I’ve definitely found some new favourites that I will need to go back to, as did Jill. I would say my top eats from the tour were the oyster sandwich from Fresh Local Wild, the BBQ pork slider from Roaming Dragon, and the chocolate diablo cookie from Tacofino. What’s funny is that Jill picked the same 3 trucks as her favourites, with the only difference being she chose the tuna ta-taco from Tacofino over the cookie. 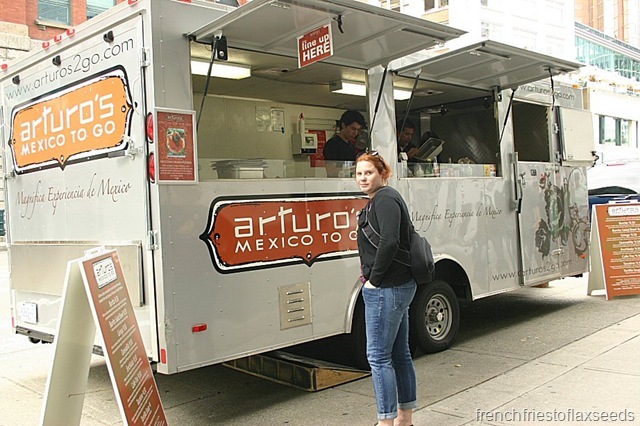 We now have plans for a food truck tour part 2 – we want to get to the trucks we missed out on this trip, as well as check out some others we passed in our travels. I’m not sure when it will happen, but you better believe I’ll document the whole experience for you again. 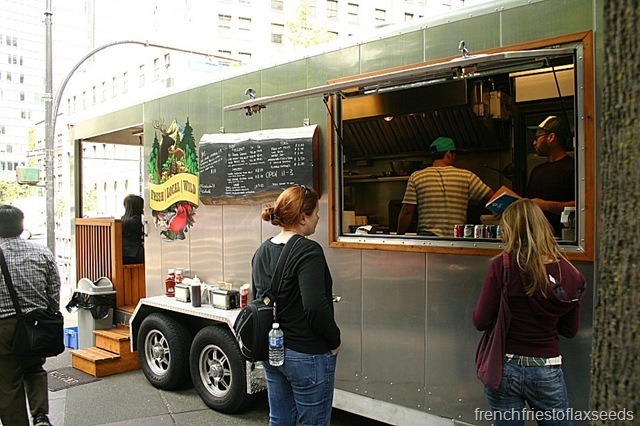 Do you ever eat at food trucks in your town? 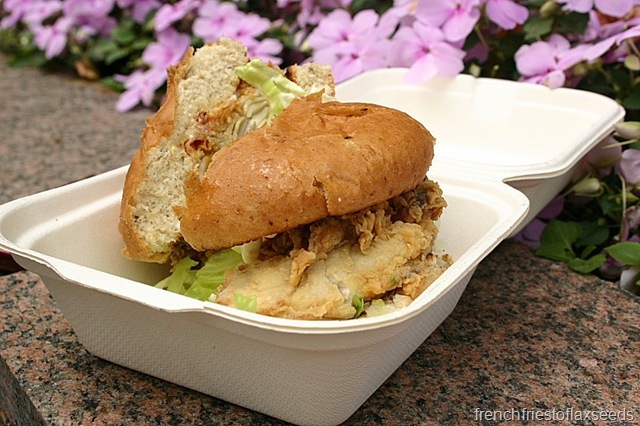 What’s the best street eat you’ve ever had? What a fab idea! If we actually had food trucks here instead of ONLY hotdog vendors, I would totally be on board. 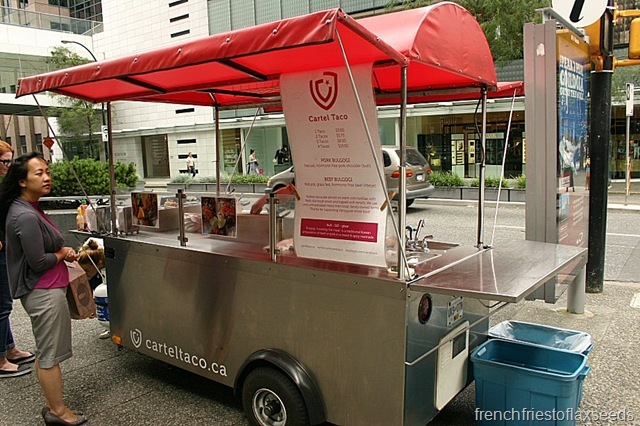 Maybe I’ll have to plan a day in Toronto….I’m more than sure they have food trucks!!! Great job! The pictures turned out great. We will have to plan the next one before Sept. I’ll e-mail you some dates this week. 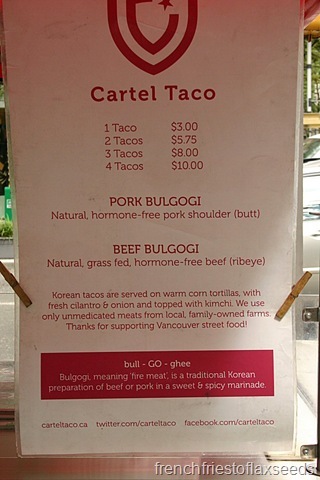 Wow, I am impressed with Vancouver’s variety in street eats! The food trucks around here are pretty few and offer only tacos. I’d love to see some different cuisines enter the picture! Our street food scene has really exploded in the past 2 years, and there are plans to add another 15 or so trucks next year (I think we currently have over 30). The city government have made it a mandate to bring in trucks offering nutritious eats, and they want trucks to take into account environmental impacts and sustainability issues. They won’t issue licenses to just anyone. 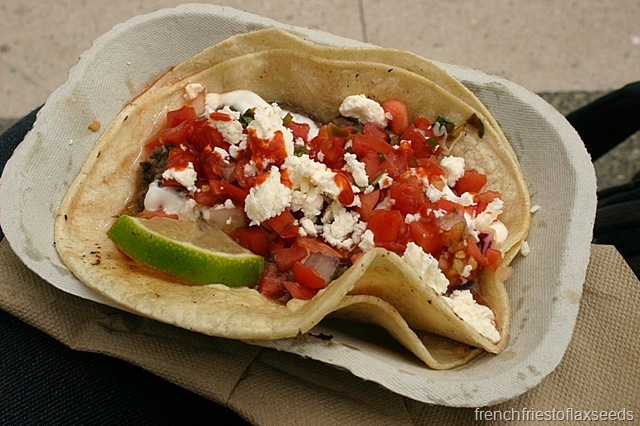 Double tortillas are kind of standard on street eat tacos. They do that because depending on the salsas that you choose, the tortilla can become too soft and disintegrate. Resulting in a ginormous taco fail. Everything looked really delicious btw but I couldn’t help but think that the profit yield on some of those eats is REALLY high! Think about it . . . . . how expensive is it to re-fry beans and add two tortillas. It’s pennies! And on top of that they’re not paying high restaurant over-head. 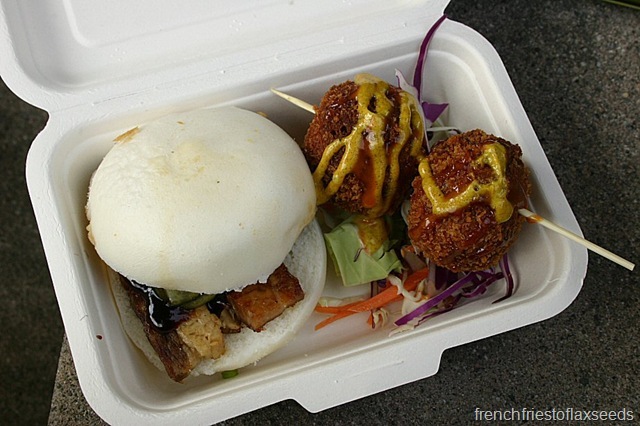 I guess that’s the thing about street food for me – it has to strike a balance between inventive, good quality, and great value. As far as the best street food . . . I don’t know. Whole Bowl in Portland was awesome but I also love the grilled oysters at Barb’s in Victoria. And last, but certainly not least, in Paris I once tried a stand that sold made to order churros. AMAZING! Proof I’m not a street taco eating pro. I kinda figured it was for integrity purposes, although I would argue the taco from Cartel Taco did not require it. My Tacofino taco however was a delicious mess. 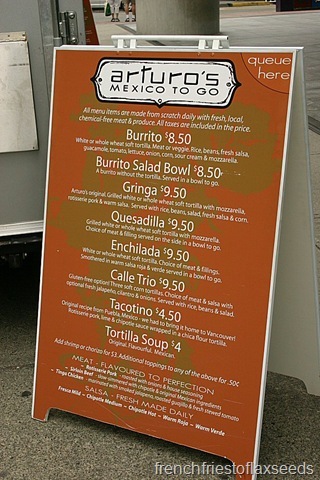 And I think the mark up on all food prepared for you, whether in a restaurant or from a food truck, is huge. You have to consider some of the people running these trucks are trained chefs, and they generally are all sourcing high quality foods. I often think I could make alot of the things I eat out for cheaper, but part of it is the experience. And it’s still cheaper than a sit down restaurant! Lovin’ that Taco!! Oh Marianne all of these eats look spectacular! 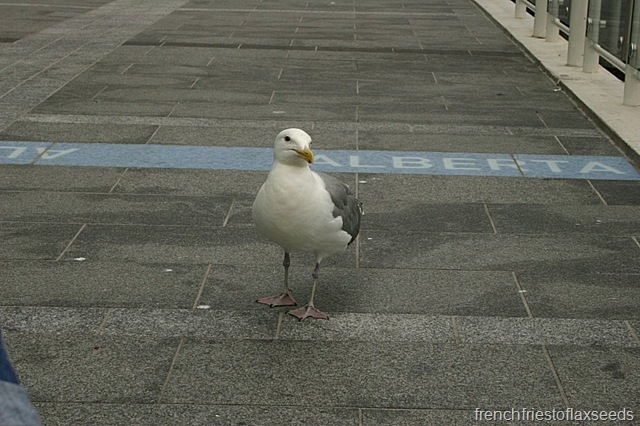 (Minus the seagull of couse) haha jk. 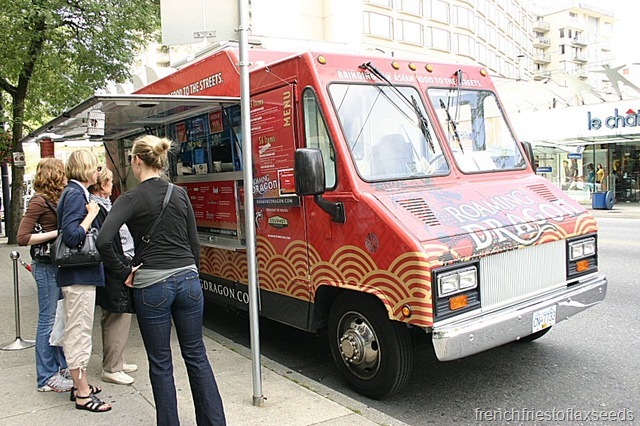 I haven’t gotten anything from food truck before but i definitely would love to experience it, especially in Vancouver on a truck crawl! Hey how did your trip to Salt Spring go!? I was hoping to see a few pics on here. No complaints tho, this post is fabulous! Salt Spring was great! Don’t you worry – I have some posts coming up from Victoria. Just haven’t had the time or the motivation to sit down and write. Columbus is getting ready to have a food truck fest next Friday and I’m so excited! We had tacos and burritos not that long ago as our first experience and they were so very yummy! Completely jealous of your food truck tour!! Since I moved out to the “sticks” 10 years ago, um, we don’t have any food trucks in our tiny town. I should start one! If you are ever in Nelson, BC you need to go to BITE! Great truck! Great food!